No matter how successful a business is, it will inevitably hit a point when it’s time to find new sales channels. This is true for a small startup showing its product to the world, a huge publisher thinking about going online, and an offline book retailer looking for a new way for customers to interact with their business. Book publishers and retailers often arrive at the idea of creating an e-reading app. If you feel like this is exactly what you want, read this post. Here we reveal how to successfully make a reading app and boost your online sales. Additional value for customers, who will have one more way to interact with your business and can buy directly from the app instead of browsing the internet. Better brand awareness, as more people will be able to learn more about you through an additional channel. Improved brand loyalty, as customers will return to enjoy your app. Higher sales, as you’ll have one more source of revenue and an app usually facilitates the checkout process even for offline sales. What book retailers have already created their own apps? Let’s take Barnes & Noble, one of the world’s largest book retailers, as an example. Over a decade ago, in 2004, the company was looking for new sales channels. That’s when the bookstore giant launched a website, stepping into the online game. The next step was developing the Nook, an e-reader to compete with big players such as Amazon’s Kindle and the Kobo eReader. Not only did Barnes & Noble create a handy device, but they also introduced a set of reading apps to make readers’ lives more convenient and to add a new channel for sales. 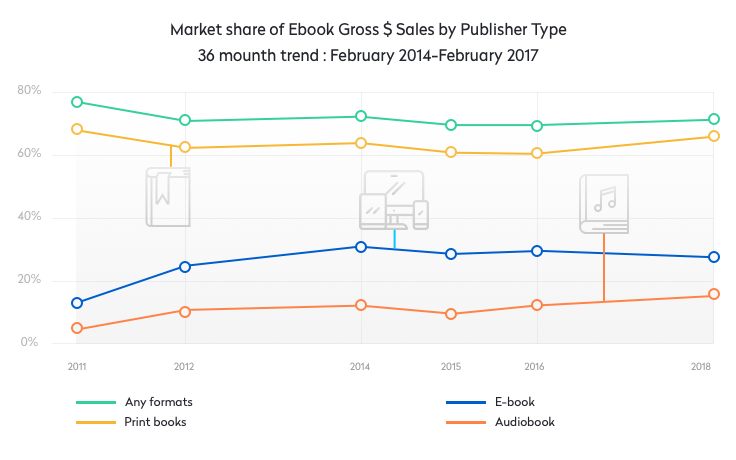 In just a year, Barnes & Noble got an additional $277 million from Nook-related sales and successfully obtained around 27% of the US ebook market. Today, when everyone owns a smart device with a good screen to read on, like an iPhone, an iPad, an Android tablet, etc. demand for separate gadgets for reading is decreasing dramatically. But a handy app to buy and read ebooks is always welcomed by users. If you’re thinking that it’s pretty scary to jump onto the train with a big market player and you’ve got no plan for that, cheer up! We’ll tell you what your app needs to step into the game: what basic and killer features to include, ways to get more authors and publishers to provide diverse content, and the best ways to monetize your reading app. But first things first: let’s start with the basic features. What are the essential features of any modern reading app? A store within the app along with user libraries with a collection of diverse books to choose from. Support for top ebook formats (EPUB, PDF, LIT, AZW, ODF, MOBI). Text formatting, like font and size adjustment, to make reading more convenient on any screen and to meet users’ needs. Color themes and backgrounds so that users can customize the app. Cloud storage for books with the ability to download them on-demand to save users’ precious storage on devices. Search for text, books, and categories to make sure users find everything they need. Bookmarks, text highlighting, and notes so that your users can mark parts they find exciting or remember where they stopped reading. A help center to make sure that your users can get through any issues. Social network integration for easy registration and sharing notes or quotes from books. Now that you know the basic features to start with, you’re probably thinking about how to get into the market with such big players as Google Books, Kindle, and Moon Reader. Don’t worry. There’s still room for one more! You can try adding some killer features to your app to catch attention and make users loyal. Check out our suggestions below. What extra features should I add? Basic features are only a starting point for satisfying customer needs. You can spice things up with some extra features to make your app stand out. The results of a study by Deloitte prove that a decent percentage of users not only demand personalized communication but also personalized services. 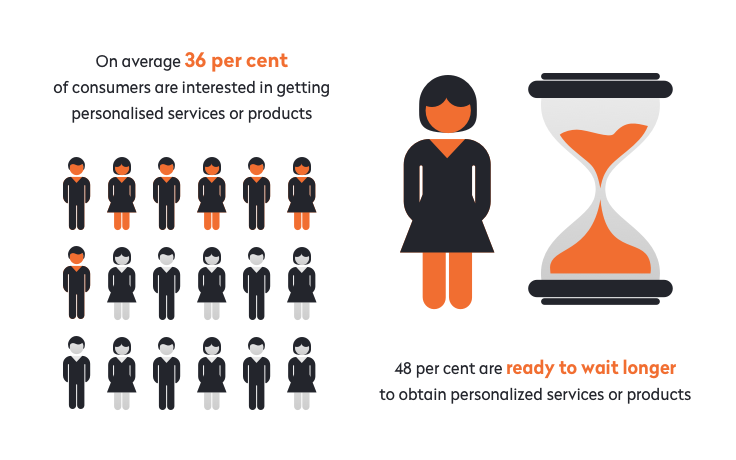 To be more precise, 36% of consumers in the US are looking for personalized products. Let users choose the content and topics they like just by going through a set of welcome screens. Adding a couple of questions can help readers to screen out the genres and books they don’t enjoy. Another idea is to suggest some reading plans that they can later adapt based on progress. This way, users will have something to achieve and can track their progress. Barnes & Noble took this one step further, creating Browsery, a dedicated app for passionate readers that provides personalized content. You can make night mode a basic feature if you like. The idea is pretty simple: give users’ eyes a break from strong light by changing the UI to darker colors when in night mode. Try out the Wattpad app for an example of this feature. Let your users read not only on a mobile device but on any gadget with any operating system. For that, you’ll need a web version of your app, like Kindle Cloud Reader. The cherry on top is that you’ll be able to scale your app if you create a web version, which means more cool features and more customers in future. If you’re planning to give your users access to literature in different languages, providing on-demand translation is a good idea. For instance, you might let users tap on a word they don’t know and see a translation by Google Translate or Amazon Translate. You can check out the KyBook Reader to see how this feature works in an app interface. Even though we live in a world that’s constantly online, sometimes people prefer reading books offline. This saves data, especially when the ebook file is big and takes time to load. But you can even go further than offering offline access by allowing users not only to download books but also to upload their own ebook files to the app. This way you’ll be able to attract local libraries and self-published authors to provide more books. OverDrive is one tool you can use to translate this feature into reality. Looking forward to a new book? Then you probably wouldn’t like to miss the day it comes out. The same goes for your users. You can remind them about new ebooks, discounts, special offers, and recommendations. The Amazon Kindle app does that, and it works pretty well. Get users to interact with each other within your app. Build up a rating system with comments and likes so that people can learn more about books and choose ones they’ll truly enjoy. Goodreads is an example of a perfect network for readers, where users can easily add reviews, suggest books to read, and track each other’s progress. Some people are fans of listening to audiobooks instead of reading, as they can listen hands-free and walk or run while enjoying a book. In January 2018, 18% of US adults surveyed by the Pew Research Center said they had listened to an audiobook in the past year. So why not expand your audience and allow audio content as well? If you’re looking to check out an app that successfully provides audiobooks online and offline, try LibriVox. As an alternative to audiobooks, many reading apps provide text-to-speech functionality so that users can listen to books when it’s not comfortable to read from the screen. Some apps, like Cool Reader, offer this feature out of the box. Others, like FBReader, let users download a plugin for the text-to-speech feature. Moreover, you can add a couple of voices to make listening more comfortable. According to copyright laws, you can’t just post anything you wish in your library. You’ll need diverse content channels, partnership agreements, and author permission to offer books to your customers. Moreover, you’ll need to provide publishers and authors with royalty payments for books sold. But you probably knew that already. You need something more than the content you already have, don’t you? Let’s have a look at Barnes & Noble as a good example of how to get content from multiple channels. Aside from working with publishing partners, famous authors, and huge affiliates like CJ, Barnes & Noble created their own publishing project, started collaborating with college textbook authors, created a reading device along with a reading app and, finally, provided good opportunities for self-published authors. 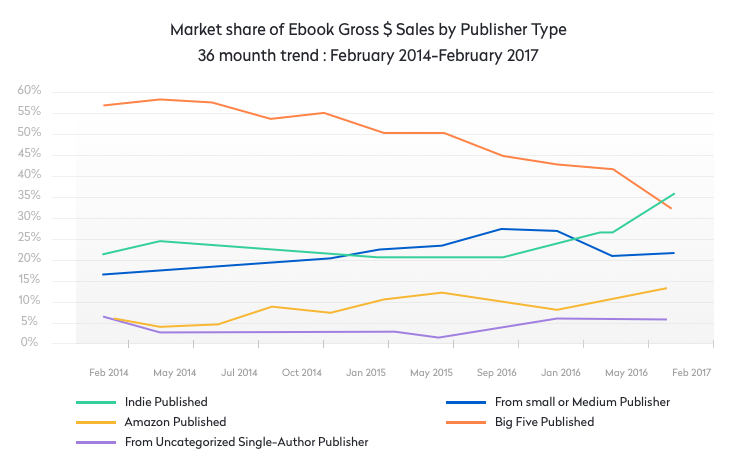 Yep, self-publishing is a real thing, and self-published authors sell about 30% to 40% of all ebooks in the US market. These authors are the gold mine for anyone looking to create a reading app. Attracting self-publishers will not only bring you a wide selection of content but will also allow you to get extra revenue by selling different types of books. But there are more ways to attract money to your book business. Most reading apps today use the freemium model, providing the app for free and allowing users to purchase books from a built-in store. Moreover, to promote their books, these apps often use newsletters and ads, which seems to annoy users a bit (or more than a bit). What are some other, more effective ways to make money from a reading app? Instead of selling separate books to users, let them read as much as they want by purchasing a monthly or yearly subscription. You can create different types of subscriptions, providing extra features like access to special book editions, journals, and audio content with premium subscriptions. This is exactly what Kindle and Scribd provide with their unlimited subscriptions. Another way to monetize your app is to get some partners with a similar customer base. You can add partner ads to your app and ask your partners to do the same. One step further is creating an integrated experience, bringing some features of a third-party app into your own app. This is exactly what Localytics and Optimizely did, teaming up to provide mobile analytics services teaming up. You could also help authors make their books better by providing editing, cover design, and marketing services. This can also allow you to guarantee your readers top-quality content, as you’ll be in control of the quality of ebooks. BookBaby provides the services mentioned above. As you can see, there are plenty of things to consider when building a reading app as a new sales channel and a new product to drive more revenue. Even though there are so many fish in the sea of reading apps, unique features can still attract users and drive lots of revenue. If you want to create an e-reading app and have some questions, let us know. We’ll be happy to answer them.